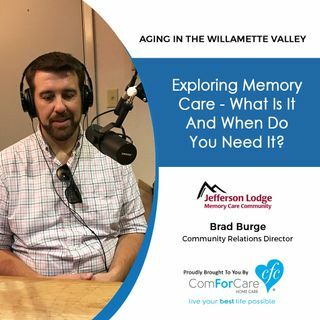 10/24/17: Brad Burge with Jefferson Lodge Memory Care Community | Exploring Memory Care - What is it and when do you need it? Brad explains what a modern Memory Care community is, as opposed to the old-style nursing home that many have stuck in their minds. He provides some guidance to families who are dealing with a loved one with dementia and how to pinpoint the signs that it's time to seek professional help. Brad also gives an overview of dementia.